Jochen Brusch, violin; Sven-Ingvart Mikkelsen, organ. TIM Scandinavian Classics 220577-205. 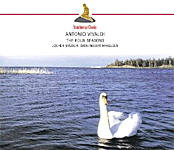 Although Antonio Vivaldi (1678-1741) wrote more pieces of music than any normal person should have been capable of producing, people will no doubt continue to know him best for his Four Seasons violin concertos, the little tone poems with their chirping birds, galumphing horses, barking hounds, and dripping icicles. The music lover has about 800 different recordings to choose from at any given time, and that number changes almost weekly as new discs arrive on the scene. Naturally, it takes an extraordinary recording to make a dent in the avalanche of discs cascading down on them, and you have to admit that a transcription of the Seasons for violin and organ is different, even if it is not really extraordinary. In these violin-and-organ arrangements by organist Sven-Ingvart Mikkelsen, the violin is well out in front of its companion instrument, which seems in a larger, more spacious acoustic. Nevertheless, the organ fills in the details, the sound effects if you will, quite imaginatively. And, of course, it adds a solid bass foundation for the concertos often not found in traditional renderings. The opening movement of "Spring" is quite zesty, with the sparkle and freshness of new beginnings. Then, the Largo appears practically mournful, making one of the most-pronounced opposites I think I've ever heard in this music. After that, the duet of Mikkelsen and violinist Jochen Brusch offer a closing Allegro with a surprisingly moderate tempo, an intermediate pace making this "Spring" a season of contrasts. "Summer" arrives with a more shimmering, sultry atmosphere than we normally hear, reinforcing the impression that this is no ordinary Vivaldi interpretation. As the first movement proceeds, it picks up more energy, and then it falls back into the lazy warmth of a sunny day. The Adagio had this listener nearly wanting to take a siesta, before the snappy closing Allegro brings everything back to life. Likewise, "Autumn" and "Winter" come across with almost equal invention from the duet. Brusch and Mikkelsen never glamorize the music but emphasize its subtle beauty and gentle nuances with enthusiasm. Now, if I could have just overcome an irresistible urge to get up and skate, I'd have found the performances close to perfect. Admittedly, the duet intend the transcriptions as novelties, not as primary readings of these works; still, they're entertaining novelties. Originally made by Classico in 2002 and licensed by The International Music Company Scandinavian Classics for release in 2010, the recording underscores the violin, with the organ sometimes so quiet it's almost silent. In other words, the organ knows its place in these "violin" concertos. However, when the organ does make a statement, it's big and bold, with a strong deep bass. The acoustic is big and airy enough for it to complement the resonant sound of the organ without drowning out the sound of the violin. So, for the most part, the audio engineers balance the two instruments pretty well, and organ afficionados in particular will enjoy it for its elegant, sonorous tones. To wrap up the disc presentation, Scandinavian Classics enclose the jewel case in a delicately embossed slipcover. Incidentally, for those listeners seeking a more traditional approach to The Four Seasons, my personal favorites include on period instruments Kuijken and La Petite Bande (Sony), Sparf and the Drottningholm Baroque Ensemble (BIS), and Pinnock and the English Concert (DG Archiv); on modern instruments, Marriner and the Academy of St. Martin in the Fields (Decca), I Solisti Italiani (Denon), and Jansen and company (Decca); and for a big-scale production, Perlman and the LPO (EMI).